In the center of the Historic District, this elegant inn is made up of two town houses built 50 years apart. Expect stunning architecture and beautifully appointed accommodations: all have fireplaces and reproduction antique furnishings. Four have whirlpool tubs where you can relax after exploring the city, and three have balconies. Ask for a room overlooking Chippewa Square, where Forrest Gump sat on a park bench giving a dissertation about a box of chocolates. There's also a carriage house to the rear of the property with less expensive rooms. Afternoons are marked by a charming tea service, and complimentary wine and hors d'oeuvres are served in the evening. YOU SHOULD KNOW Although the standard non-penalized cancellation is 72 hours, cancellations for stays during the Rock & Roll Marathon and St. Patrick’s Day require a full 30 days notice. 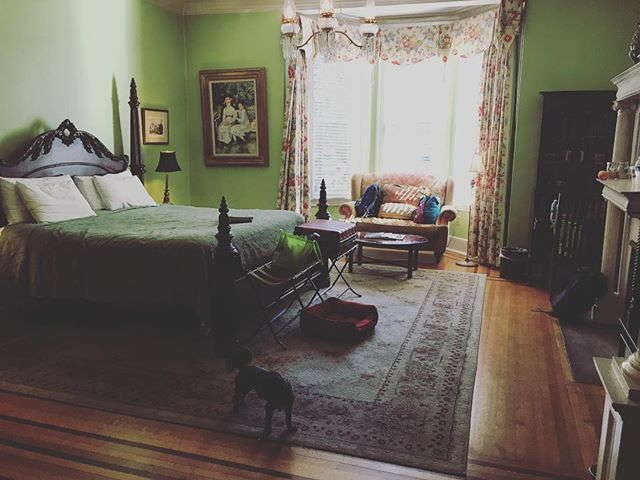 The 19 guest rooms are all stunning for their adherence to authentic historic charm. All rooms are appointed with beautiful antique furniture and come standard with 32 inch flat screens, or bigger. Most rooms come with a working fireplace. Rooms 203, 305, and 403 are set aside for visitors with pet allergies. They never have any furry guests. Every room has its own private bathroom. Soft bathrobes and Aveda products complete the luxury ambiance. 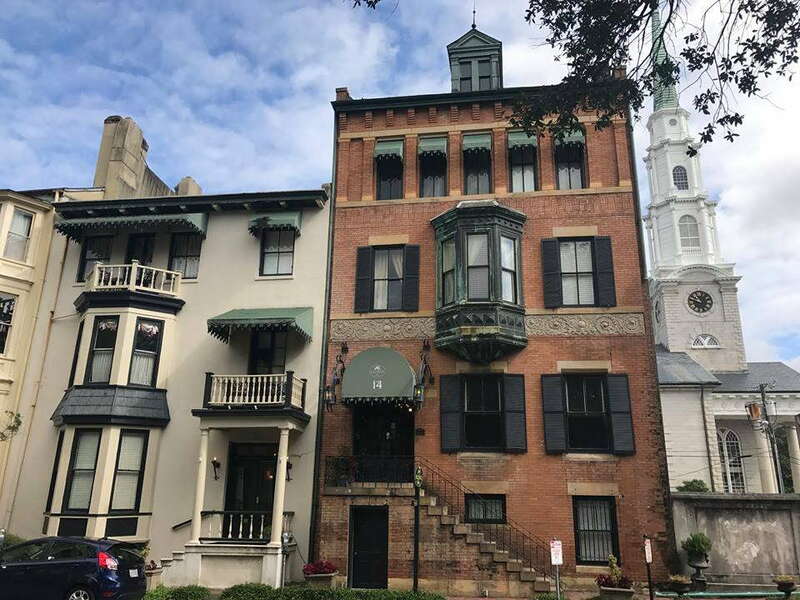 After climbing the exterior steps and entering the historic row home on the second floor, guests are greeted with a cozy parlor and an attractive dining room filled with period furniture. Chandeliers, fireplaces and ornate molding beget a warm and romantic feeling. The floorplan leads out through the back door, revealing an intimate courtyard, dotted with pristinely manicured shrubbery. 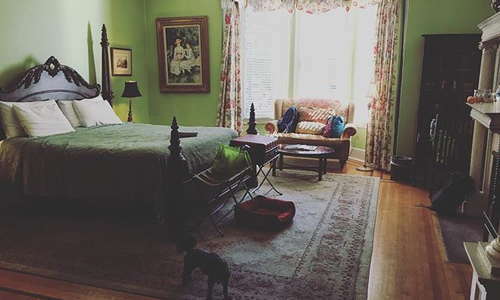 YOU SHOULD KNOW The Foley House Inn may be the most pet-friendly lodging establishment in the entire city, with no breed or size restrictions. The only caveats to the policy are that pets are not allowed in the dining room and parlor, and a cell phone number must be left with management in case the owners are needed. A single $50 per pet, per stay is about as reasonable as can be found in the area. Breakfast is individually cooked to order each morning. In the afternoon, guests are treated to sweets and tea. Before heading out to dinner each night, make sure to join the other guests for complimentary wine and hors d'oeuvres. This also provides a perfect opportunity to peruse menus from nearby restaurants and a chance to share tips and tricks learned from the day’s adventures. While staying here, visitors are deep in the heart of the Downtown Historic District, so it's most enjoyable to park the car for as long as possible and walk, bike, pedicab, or take a trolley tour. Guests will have to search for on-street parking. Alternatively, Liberty Parking Deck is a 4-minute walk, due south of the bed and breakfast. Collins Quarter (3-minute walk) is a great spot for lunch/brunch. High ceilings and comfy booths complement the creative American fare nicely. After lifting the original Husk in Charleston to international renown, James Beard Award-winning Chef Sean Brock recently unveiled Husk Savannah (3-minute walk). Make sure to book far ahead, as everyone and their grandma is trying to grab seats at these tables. Artillery (4-minute walk) serves some of the most delicious cocktails in town in a cozy space, fitted with countless ornate details. Sharp-dressed bartenders pour over their rare ingredients like scientists. Six Pence Pub (2-minute walk) is a traditional English haunt, complete with a proper English phone booth and countless ales on tap. 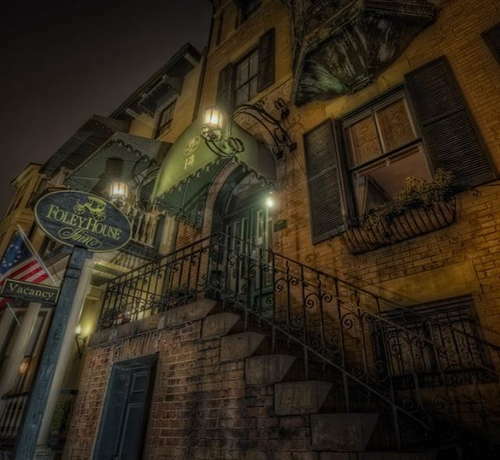 If you are looking for a genuine southern experience that truly captures the charm and historical relevance of Savannah, the Foley House Inn is tough to beat.